I made this stew years ago when Chris and I first started dating and I was learning to cook. I remembered this stew was tasty but at the time, I didn’t have all the ingredients readily available. I left out olives and didn’t use beer. Boy that was a mistake! 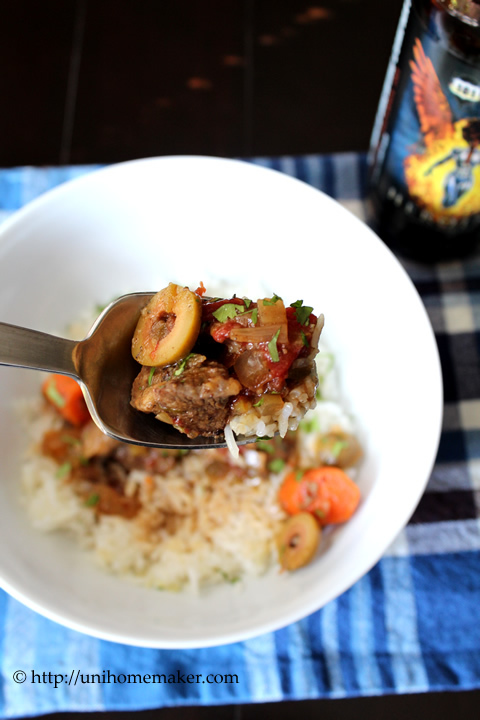 I’m not big on olives or beer drinking but it sure made this stew tasty. 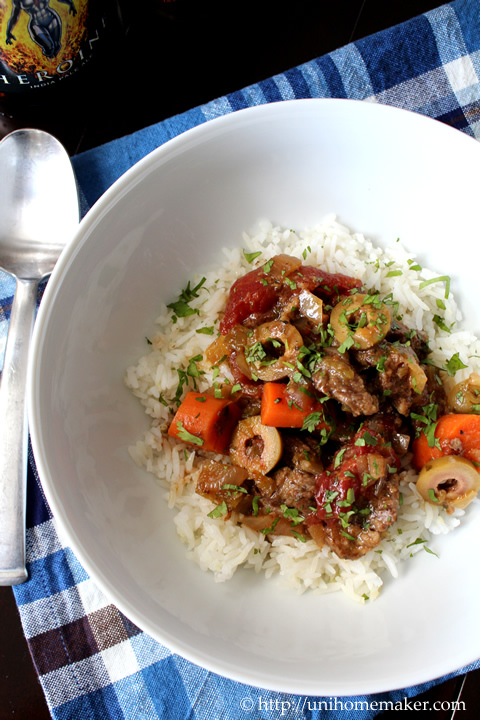 So when you’re in the mood for stew or just want something comforting —look no further! Season beef with salt and pepper and coat with flour. In a large Dutch oven over medium high heat, add olive oil and meat. Cook until the beef is browned and golden around the edges, about 6-8 minutes. Do not crowd your pot. Do it in batches if necessary. Transfer meat to a bowl and set aside. In the same pot, add chopped onions, garlic and carrots; lightly season with salt/pepper (don’t over season as the olives are salty), sauté for 5 minutes. Add oregano and continue to stir, 2-3 minutes. Deglaze the pot with beer, scraping up any browned bits. Then add stewed tomatoes, diced green chilies, beef broth and green olives. Bring the stew to a boil and then reduce to low heat. Cover and simmer until beef is tender, about 1 hour. Check for seasoning, if needed and stir in cilantro. Ladle stew into a bowl and garnish with additional cilantro. You’re so sweet, thank you Kelly! 🙂 Hope you’re having a lovely Mother’s Day! Beef, beer, chilies…you had me at beef. The beef was definitely flavorful. I wouldn’t have bought the Angus beef if it wasn’t the only thing the market had. I normally splurge when it comes to steaks, but with stew meat I figure it’ll get lots of flavor from the braising process. But in this stew, the primary flavor was beef. It made me an Angus believer. This stew looks so gorgeous. I might need double that amount of rice to savour the sauce. So hearty and comforting. Thanks Jayne! The sauce was fantastic. It’ll be good with rice or crusty bread. We had it with beer bread and it was outstanding! this looks fabulous! I love the green olives idea. 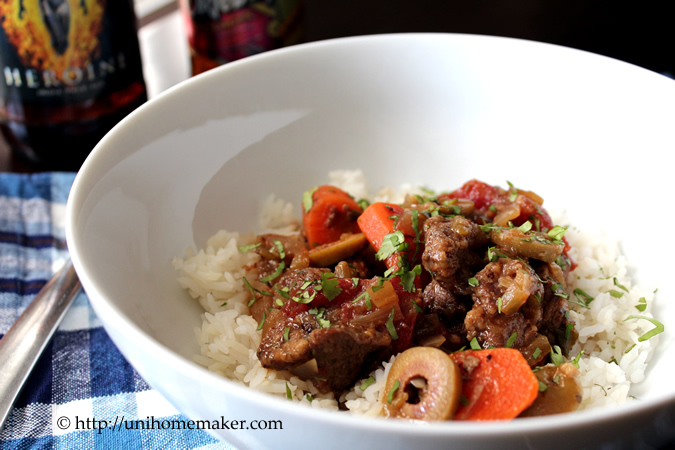 I love my beef stew recipe and never thought of straying away from it….hmmm, change is good, right? Plus the cilantro seems like a great addition. looks like great flavors! Hey Anne, this looks great, I think my husband would love it too. Can you think of another alternative besides using beer? Hi Anne – my husband, who loves beef stew, also loves olives. The addition of the beer is interesting. I’ve had a similar experience with buying more expensive cuts of meat and then it’s so good, I can’t go back! This looks like a wonderful dinner! I totally agree! I can’t go back either. Thanks for taking the time to comment Monica. This stew sounds super big on flavor! Perfect to warm a chilly night. My husband loves stew! I’ll have to make this for him! Actually, those olives are calling out to me… Lovely! What a great combination of flavors and textures in this stew. It looks fantastic. Oh yum! This looks so hearty and delish! Loving all of the great fresh ingredients in this stew! Love how you put it with rice. You are just amazing, Anne! Have an amazing weekend! Hugs! My husband would absolutely love this. It’s been pretty chilly here too … I’ve been craving comforting food! It’s been chilly here too the last couple days. Nothing beats a good stew on a cold, rainy day! That looks delicious. TOday is gorgeous in NYC, tomorrow we have rain, and then the weather cools down a bit. the weather is definitely a bit off for May. That must’ve tasted amazing, on a cold night. Actually, any night for me. I’ve noticed over here that both stewing type beef and pork are more expensive cuts. Go figure! And I though stewing meat was always cheaper. Anyway, love that spoon, and another great shot. I haven’t been practising mine – shameful, I know. 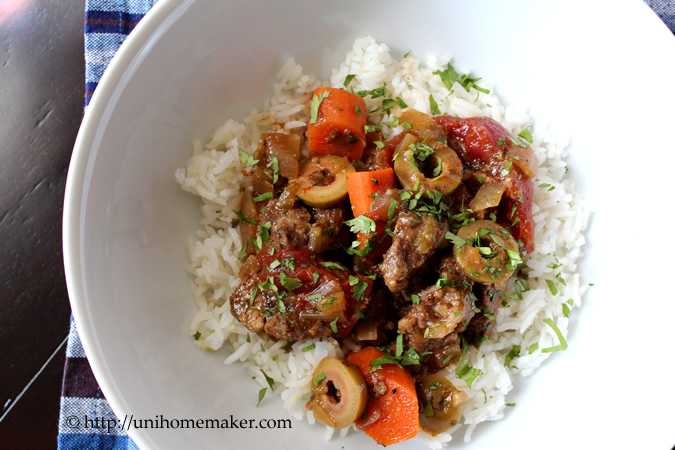 I wouldn’t think to add olives to a stew but this stew looks so good with them included. Throw in the diced chilies, beer, and cilantro and you’ve got something special brewing in that pot. THis will be a recipe I’ll come looking for this Fall. Thanks, Anne. A stew (one of my favorite foods ever) with beer and olives, that´s a great sounding recipe! I never would´ve added the olives really, but beer makes a difference. I love cooking with it. So do you still have some of those Jalalpeno Corn Muffins? They would go perfect together. That’s the perfect stew for me, of course anything with green chile is perfect! Anne, this looks like comfort food at its best! What a great dish! I love all things ranchero 🙂 so genuine and hearty! Though we don’t eat beef, this absolutely looks delish! Yummy! I was looking for a stew recipe to make in my slow cooker and this looks perfect. Lovely recipe Anne.